Iran will respond to a proposed deal on its controversial nuclear programme by the middle of next week, it has told the UN's atomic energy agency. Agency chief Mohammed ElBaradei said he hoped the answer would be "positive". The UN watchdog had suggested exporting most of Iran's enriched uranium to Russia and France for further refining. The proposal followed talks between the UN, Iran, France, Russia and the US. Friday was set as the deadline for a response from Tehran. The draft deal, agreed by the US, France and Russia, was prompted by concern over Iran's nuclear programme. "Iran informed the Director General today that it is considering the proposal in depth and in a favourable light, but needs time until the middle of next week to provide a response," the IAEA said in a statement. Iran is giving extremely mixed messages over this important deal and has missed a deadline from the UN to give its verdict. Either Tehran is playing for time or there are genuine differences within the Iranian government. At one stage Iranian state TV said Tehran could not accept a key part of the agreement, shipping the nuclear material out of the country. Later Iran told the UN nuclear watchdog that it was considering the plan favourably but needed more time to respond. If the deal does go forward it would provide some evidence that negotiations with Iran can bear fruit, if not then the wider talks process would face a bleak future and new sanctions would once again be on the agenda. It said Mr ElBaradei hoped that Tehran's response "will equally be positive, since approval of this agreement will signal a new era of co-operation". In Washington, State Department spokesman Ian Kelly said: "We hope that they will next week provide a positive response." He added that "obviously we would have preferred to have a response today [Friday]. We approach this with a sense of urgency". Under the proposal, Iran would get the fuel it needs for its research reactor in Tehran, but this would not be sufficiently enriched to make a bomb. However, Iranian media earlier on Friday raised new conditions for the deal. State TV said Iran would prefer to buy uranium for its research reactor, rather than send its own stock abroad for enrichment, as proposed. It quoted a member of Iran's negotiating team as saying: "Iran is interested in buying fuel for the Tehran research reactor within the framework of a clear proposal... we are waiting for the other party's constructive and trust-building response". Before the IAEA statement, France said Iran was not responding positively to the deal. French Foreign Minister Bernard Kouchner said during a visit to Lebanon: "I cannot say that the situation regarding Iran is very positive. "Now, meetings are being held in Vienna (the IAEA headquarters). But via the indications we are receiving, matters are not very positive." Iran's rejection of the deal would come as a disappointment to the US, Russia and France, and it could make the wider negotiation with Iran much more difficult - and the threat of sanctions more likely, says the BBC's Bethany Bell in Vienna. Russian nuclear industry insiders have told the BBC the proposed process would involve Iran sending its uranium to the IAEA, which would forward it to Russia for enriching. 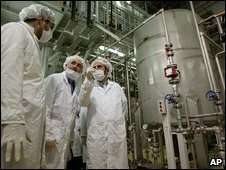 The enriched uranium would then be returned to the IAEA and sent to France, which has the technology to add the "cell elements" needed for Iran's reactor, they said. This process would enable Iran to obtain enough enriched uranium for its research reactor and for medical use, but the uranium would not be sufficiently enriched to produce a weapon. Iran insists its nuclear programme is solely for peaceful purposes and that it has the right to enrich uranium. It revealed in September that it was building a second uranium enrichment site, in the city of Qom - much to the anger of world leaders who said Iran was building it in secret. IAEA inspectors plan to visit the site on 25 October.